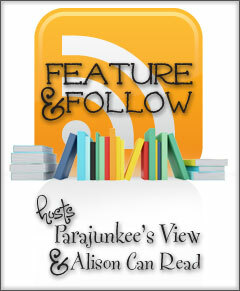 The Best Books Ever: I'm the Feature on Follow Friday! I'm the Feature on Follow Friday! Welcome to everyone who has hopped over from Parajunkee or Alison Can Read! I am so excited to be one of the feature blogs for this week! I love following other people and I try hard to comment and visit blogs! If you want to follow me via Twitter, Goodreads, or Facebook- the links are on the right- just let me know and I will follow you back! PS- Make sure you come back starting Monday- it is my BLOGOVERSARY WEEK and I will be having Giveaways EVERY DAY!!! WOOT! The longest book I have read? The Bible- that counts right? As for a fiction book- my guess would be The Sweet Far Thing by Libba Bray (892 pages) or maybe Order of the Pheonix (870 pages). My favorite 600+ reads? The Harry Potter books, the Twilight series (at the time- I am kind of over it now ha ha) ... except Breaking Dawn (not a fan), and the Eragon series. I always forget the Twilight page count. Congrats on being featured! I had to go look it up, I didn't know ANY page counts for books- ha ha! Congratulations on being the feature! I've only read Harry Potter, but I'm still trying to give Twilight a try, since I've only read the first book and I'm really hesitant to start the next books. The second one is pretty good- the only one I really disliked was Breaking Dawn... thanks for hopping by! I with Jamie, I forgot Breaking Dawn as well. Congrats on being featured!! New follower here. Sadly, I've not read any of the Harry Potter books. But I have read the Inheritance Cycle and Twilight books. I know, not many 600+ books that I have read. I would probably say Harry Potter too but I still need to read that series. I had actually forgotten about The Sweet Far Thing! It's such a great book too. I said breaking dawn cuz I couldn't remember if the other Twilight books were more than 600 pages. LOL. Anyhow, I'm a new follower. I second the Harry Potter series. Totally forgot about how long they were. Old follower! Congrats on being featured this week! I forgot about some of these books and how long they actually are. I'm an old follower wishing you a great weekend. Congrats on being the feature. : ) I have a feeling HP will see a lot of blogs today. Congratulations on being the Featured Blogger! I'm now following you! Happy Follow Friday! Great choices. I'm a new follower. Congrats on being the feature! I know Harry Potter is so well loved, but I never got into it, didn't have the same effect on me as it did others. I'm your newest GFC follower! Happy #FF and congratulations on the feature! Congrats on being featured! I feel the same way as you with the Twilight Series! New follower from FF! Following via GFC and Networked Blogs!! New follower here, via GFC, I am apparently not to in tune to how long my books are I keep seeing stuff I've read and going OH wow that was over 600. Congrats on being featured!! New follower on GFC. I've only read a few books with 600 more pages..my favorite was Incubus Dreams by Laurel K. Hamilton. I still can't believe Breaking Dawn was over 700 pages. LOL It took me two days to finish it when I bought it a few years ago. Hopping through. Congrats on being the feature! I didn't realize the Libba Bray book was that long. I've read that too. New follower and my firs FF hop. Nice to meet you and congrats on being one of the featured this week!! I never really pay that much attention to the number of pages. I still love Twilight!! Books not so much the movie. Thanks. Congrats on the feature! I had a feeling I'd see Harry Potter a few times this FF! But great picks none the less. New follower via Twitter and GFC. Happy Friday! And this is a great question! I read some historical fiction books that were more than 1000 pages:) Totally loved them! You're rigth the Eragon and the Harry Potter series are awesome, I agree! Hi there :) just hopping through...Harry Potter rocks, great choice! I picked Stephen King's 11/22/63, but I forgot all about Harry Potter and Eragon. I guess I was so engrossed I didn't realize how long they were. ;) Followed you on Twitter. You've read the Bible from cover to cover? Respect. I too found it hard to come up with long books to put on my list - but I refused to include Breaking Dawn as it's the one book I've ever thrown across the room in anger! Congrats on being the feature of the week! New follower :) I love these comments. I'm glad to see there are others who felt the same way about Breaking Dawn as I did. I wished I would have stopped after Book 2 of the series. Anyways Here's My Friday Follow! I'm also not a big fan of big books. 300+ is ideal for me.Short and sweet. Congrats on being featured and happy blogoversary! For sure the Bible counts! Last I heard it's the most printed book in the world. The HP books and Breaking Dawn are for sure long. I’m sorry to say that I’m not a long book fan. The last of the Harry Potter books are probably the longest books I’ve read (that I can remember). Hey, congrats on being this week’s feature! Oh, right! The Bible!! Ha! Good answer. That should totally count. I forgot about Twilight... the movies are makin' it harder to be a fan, I guess. I didn't know Daughter of Smoke & Bone was that long!!! Great picks! Love the Harry Potter series. New GFC follower here. Congrats on being featured! New GFC Follower! I didn't realize the Twilight books were that long! Maybe that's part of the reason they were so excruciating to get through! The Bible! How could I have forgotten! Heh. I'm also a fan of most of the other books your mentioned. Including Breaking Dawn, which I loved. I know, I know. I'm one of the few. I've read the Harry Potter books and really liked them, but they didn't make my top picks. I read Eragon and was kind of nonplussed by it. Books by Brin, Gaiman, Niven, and Heinlein (among others) make my list though. Congratulations on being featured, I haven't read too many longer books either. Hopping through as a new follower! Congrats on being featured! Just saying hi from the PJV hop! If you'd like to follow back, I'm at 3500wordsperpound.blogspot.com! Yeah for Harry Potter and Eragon! Two fabulous series! Congrats on the feature! *New GFC follower* I loved Libba Bray's A Great and Terrible Beauty trilogy! And Harry Potter was mine too! New follower! I love Harry Potter, those were mine too! I also put the Bible as my longest book, but I put ShadowFever by KMM as my longest as well. Congrats on being featured this week! Love your blog and am a new follower. Hope you have a great day and happy blogoversary! Congrats on your feature! It was kind of difficult to pick the books based on page number. I'm glad that the list of the book I've read includes the page numbers and all I had to do was looks back. Congratulations on your blogoversary and on the feature! Congrats on annv and mine was Kushiels Dart by Jacqueline Carey.